Even in the simplest of installations demand significant planning and thought for the most beneficial and professional of outcomes. The Klenk Property was one such project that, on the surface, appeared incredibly straightforward but, with True Water Australia’s consummate assessment and attention to detail, numerous elements needed to be added to the install. 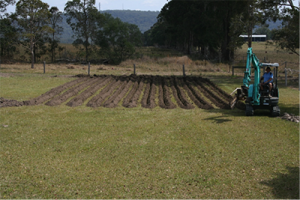 True Water Australia’s solution to the project had to include sufficient drainage and treatment for the existing structure while taking into account the ability to also service a proposed future residence. Cost-effectiveness and a range of location options also proved to require significant forward planning. Fortunately, through True Water Australia’s unfaltering expertise and experience, an excellent result was achieved for a very happy client. Overview The level open property at first presented minimal limitations, the treatment system needing only to service a shed on the expansive site. The future addition of a dwelling however meant that a higher volume of treatment would eventually be required, and the location of the proposed property and its recreational areas would also need to be taken into account, all while maintaining the most cost-effective solution. 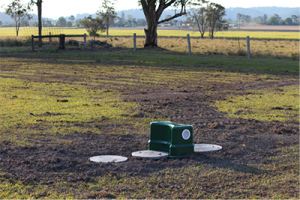 Solution The installation of an advanced secondary treatment system reduced the overall size of the disposal zone, allowing for greater utilisation of recreational areas. Several options for the location of the unit initially presented themselves but, after assessment and consideration, the final location saved the client considerably in connection costs. As with every project, True Water Australia ensured that both the client and relevant tradespeople, in this case an electrician, were consulted at every stage of the project. This is absolutely essential so as to ensure the most cost-effective, practical and legally viable solution. Conclusion Although the Klenk Project was essentially a very standard installation, it showcases the lengths to which True Water Australia analyse every parameter of a project prior to commencement. The Klenk Project proved to be a resounding success through True Water Australia’s attention to detail, high-class workmanship and continual communication and liaison between contractors and the client. Combined with the high quality product, its efficiency and cost-effectiveness and the financial efficiency of True Water Australia’s planning, work and solution, these factors resulted in an exceptionally happy client and a first-class outcome.